I gave my life to Christ when I was in seventh grade. From there on out, I was completely devoted to God, but was I really? Controversy between God and us comes about when we know what God has called us to be, but we still think we want what every one else has. So, we try to balance how much control we give Him. My freshman and sophomore year of high school, I had a rough time. Ultimately, the problem was that I was not allowing God into the darkest, nastiest parts of my broken heart. I wasn’t giving Him control of what mattered most to me. Because I didn’t hand that over to God and allow Him to move in me when I needed Him to so badly, that baggage followed me into my junior year as well. About half way through my junior year, the boy I was dating broke up with me. His reason: he truly felt like God was telling him that we both needed to be even more focused on Jesus, get our head and hearts in the right place and then he would come back. Now here was the thing: was my ex-boyfriend correct? Absolutely, but was I confused when this all erupted at first? Yes; completely. I thought I had pushed all of my problems out of my life forever, but in reality, I had just put them on pause. It became obvious that I had not dealt with my problems from earlier in my high school years. God moved in me in the most incredible way my senior year. I didn’t even know what I was missing because I had never allowed my heart to tune in to that love, and leave the rest behind. I had been stubborn. I didn’t want to be dependent on anything because my own fear was holding me back. I needed to be free of giving away full control. I needed to start releasing everything that I had ever thought was actually my own, and realize it wasn’t even mine to begin with. “Then he said to them all: “If anyone would come after me, he must deny himself and take up his cross daily and follow me. For whoever wants to save his life will lose it, but whoever loses his life for me will save it.” Luke 9:23-24 (NIV) I have learned more and experienced more of God in the last twelve months than I had in eighteen years, and it’s all because I chose to fully surrender. I decided I was done trying to fix myself constantly, fix other people and put on a perfect show. I allowed God to break every chain that held me down and do open heart surgery on my-so broken heart. Once I made this decision to let Him work, I needed to not question His motives from there on out. I knew He knew what was best for me and needed to understand that wherever I was going, He would place me right where He wanted me. This doesn’t mean that once you give your life to Christ everything falls into place and is perfect. I still had questions, like why my boyfriend broke up with me when I thought everything was fine. But the key was, because I listened and believed the sweet words that I read that He wrote to his people all through out the bible about how they were his and He was theirs, about how he was the Great I Am, and He was almighty I knew I was not going to get hurt. I could finally put my full and absolute trust in something. I wanted something that powerful and that beautiful, in my life forever. Now don’t get me wrong, this doesn’t mean all the years before I wasn’t a Christian or something…it just means God showed me a whole new level of freedom that He has to offer that I was not even obtaining because I wasn’t tuning into that access. I learned the importance of the full surrender, giving away control and abiding in the presence of the Lord. These things can help allow you to have peace about the days to come and walk your life in confidence and faith. When we commit to God and make our relationship with Him two-ways, where we are filling ourselves up with His word and then going out and practicing, a shift is made. We start to fully believe what He says about His love and calling for us. 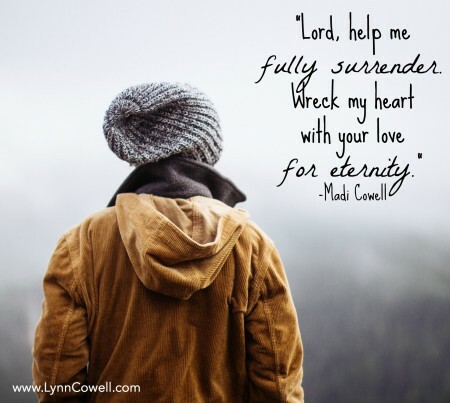 When we completely tune into the idea that the creator of the universe wants to wreck our heart in the best way ever for eternity, we will never be the same. The winner of Wednesday’s copy of Life Unstuck is Courtney who posted at July 8, 2015 at 8:16 am. The winner of Friday’s Summer Study Kit with Magnetic: Becoming the Girl He Wants is Jennifer B who posted at 2015/07/10 at 9:41 am. Please send me your full name and address at Lynn@LynnCowell.com and I’ll get your prizes right out to you! SUCH wise words and so true. Thank you for your input and taking the time to read the post, means so much! Madi- I love this!! We share with people about salvation – but we neglect to tell them about truly GIVING their life to Christ! What a fantastic truth you share. When we truly let go – surrender… life changes internally for us! Love your openness to share. You have my heart & prayers Madi you’re a beautiful writer with a beautiful love for God…I wish I had been so wise & well prepared for life at your age…PRAISE & BLESSINGS on your life & ministry – thank you. Thank you for sharing! You speak from your heart and I love how God is working through you. You are using your testimony to help others – so proud of you!! Madi..I came across your post today. I love reading what you have to say. Right now I’m thinking about how Jesus is always saying, “Come unto me. come unto me.” He does love us and is the One who is always there. Keep on writing and being Madi. You are a blessing.